Their fists clench tightly as they face each other, ready to spar. The accompanying music beats frantically, as the boys kick each other with a force. This is tomoi (kick-boxing), a popular sport in Kelantan. The crowd continues to cheer on, as the players as if in a trance focus on beating their opponent. Their coach watches carefully nearby, making sure the players follow the rules. 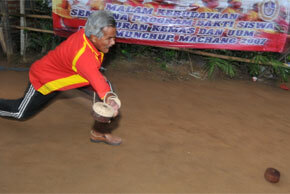 It is such a popular sport in Kelantan, that players have been known to represent the country at the international level. Another zealously guarded, yet important martial arts is silat , the traditional self-defence practised in Kelantan. It has also seen an international representation, and many have come to Kelantan in search of the best silat guru. Catch a glimpse of this art performed by hosts in the homestay. The local culture here is very much alive, and tourists’ seeking to look for culture in Kelantan, will be delighted with the age old traditions still practised. The cradle of Malay culture, Kelantan is a gem waiting to be discovered. Catch a glimpse of this, and much more while experiencing true Malay hospitality in Kelantan’s homestay!